There are golf watches, and then there is the Hublot Big Bang Unico Golf — the ultimate timepiece for wearing on the green. 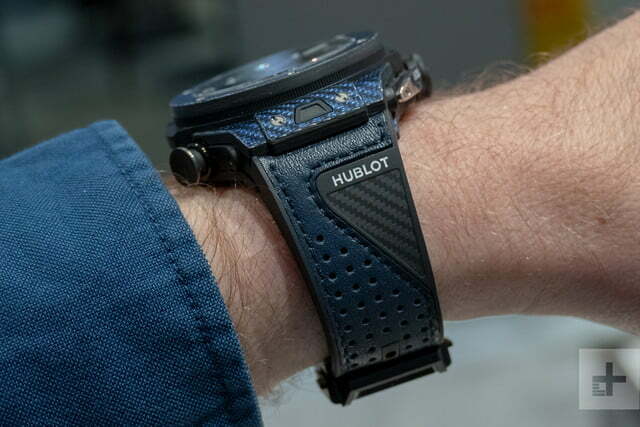 Hublot has experimented with smartwatches recently, but the Big Bang Unico Golf is not digital. It’s the world’s first mechanical golf watch designed specifically to tracking your game. 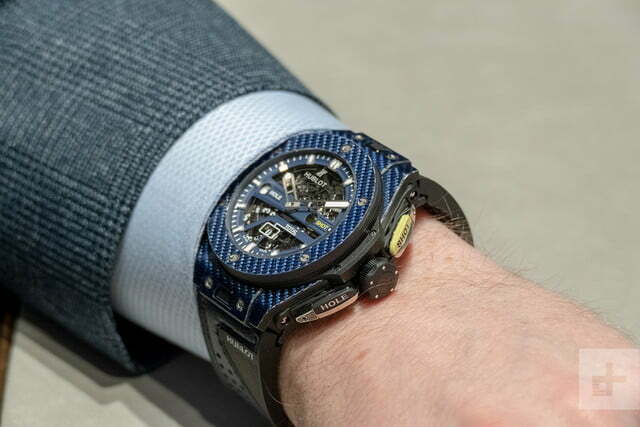 It’s a wonderfully tactile, uniquely Hublot watch that performs its function in an eye-catching, smile-inducing way. We went to see the latest version of this fabulously luxurious piece. 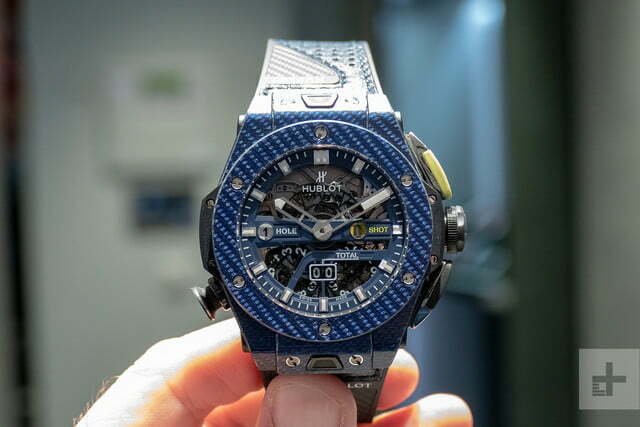 Hublot launched the first Big Bang Golf in 2018, which came in white, and has released a new version this year in blue Texalium — a material made from fiberglass and aluminum — which you can see in our pictures. 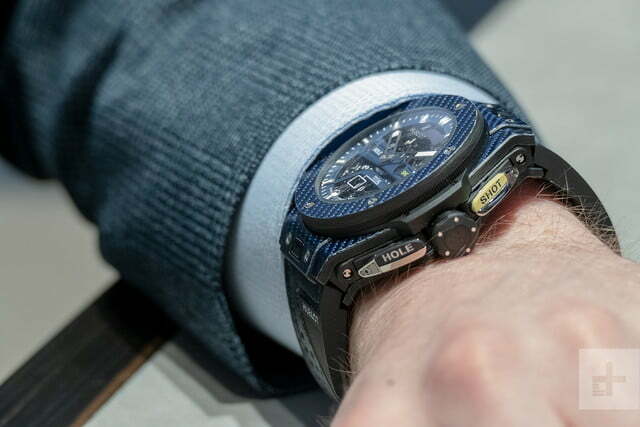 The case is made from titanium, carbon fiber, and ceramic, with anti-reflective sapphire crystal over the face and the case back, exposing the movement. The materials are high-tech, and the design is unlike any other golf watch you’ll find. The movement is what makes the watch special. 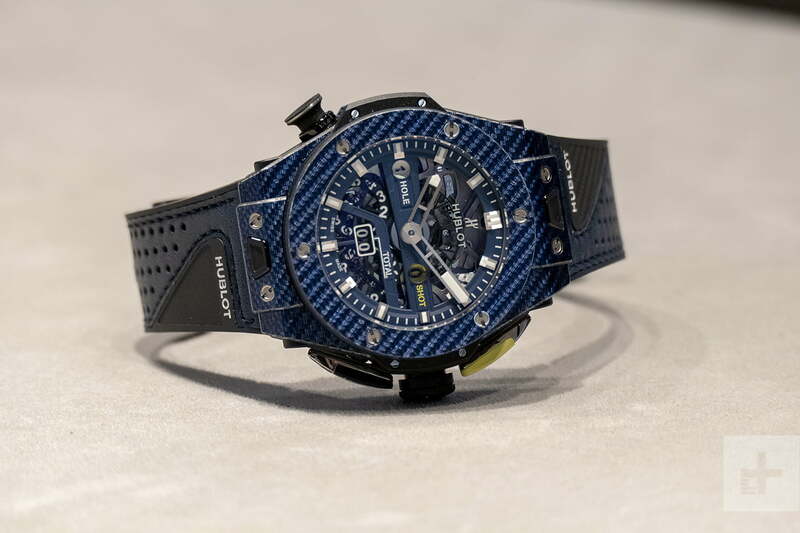 Hublot took its automatic Unico movement, which has a 72-hour power reserve, then added its own, specially-developed mechanical module to keep track of your golf game. It’s a highly technical piece of moving art, which can be seen shifting gears and turning numbers every time you press one of the buttons. How does it work? On the outside it’s wonderfully simple, but inside things are much more complicated. Looking at the watch face. There are three windows, one at 9 o’clock, at 3 o’clock, and at 6 o’clock, which show which hole you’re playing, its shot count, and the overall score. The Big Bang Unico Golf is not GPS controlled, and doesn’t alter these aspects for you. It’s all done mechanically, by you. On the right side of the case is the crown, flanked by two buttons marked Shot and Hole. Press the shot button every time you hit the ball, and the yellow figure advances, along with the overall score at the bottom of the face. When you’ve sunk the ball, press the Hole button to move on and the shot count resets to zero, while the overall score continues counting. The buttons are extremely tactile, and need some heft to operate. If you’re used to soft-touch buttons on a smartwatch, or any digital device, it feels very different. Like going back to a car without power-assisted steering. When you press down, you can feel — and see — the movement operate, and it’s a special experience. At the end of your game, the button on the left side resets everything, ready for the next game. 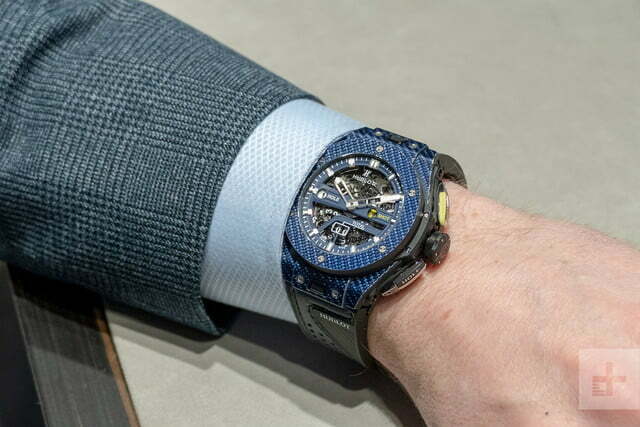 Describing this simply as a golf watch is wrong. It’s an event. From the design down to the highly-specific function, it’s a plaything for the golfer that already has all the best equipment, and their own golf cart to match, yet still knows great watchmaking. 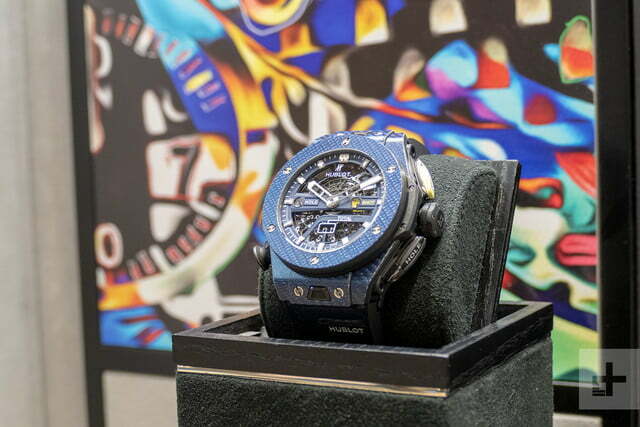 The Big Bang Unico is insane to look at in blue, with the intricate design of the face looking quite dainty next to the wide bezel, commanding lugs, and oversize crown. It really could be worn at any time, despite being really only for golfers. 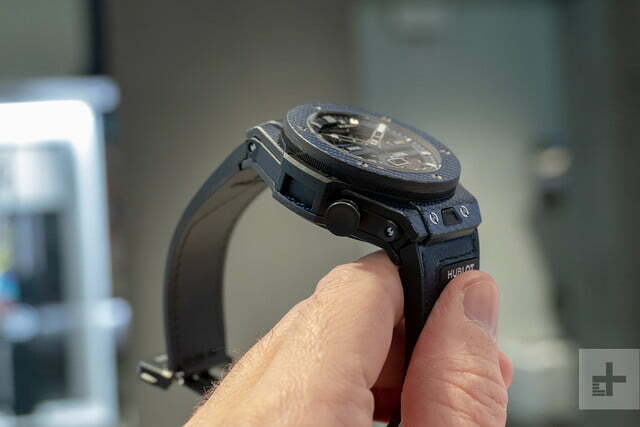 The 45mm case is large, and at just over 18mm thick, it’s not a watch for the shy and retiring. 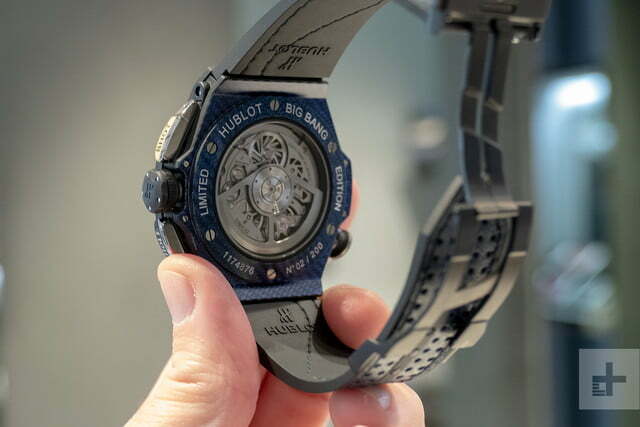 However, it’s highly wearable due to the 98 gram weight, and the well-thought out case design. It really could be worn at any time, despite being really only for golfers. 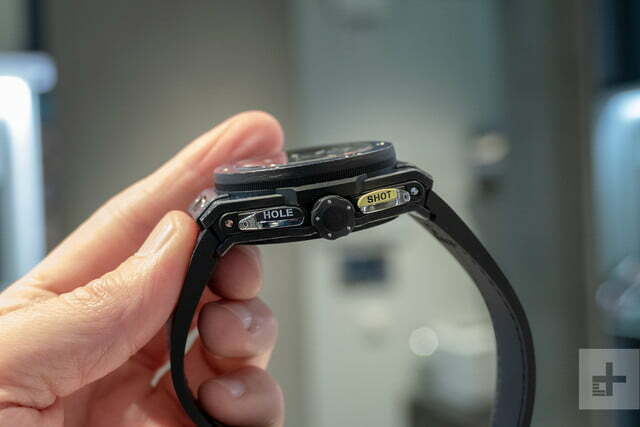 The sporty strap in the pictures has quick release buttons, and the watch comes with a second, all-black strap to make it slightly more formal. Look closer and you begin to see all the golf-inspired design nods. The shot and hole buttons resemble the head of a putter, the reset button looks like a golf tee, and the sports strap has a look reminiscent of a golf glove. Hublot has a rich history of making watches linked to sport, or sporting brands, from Ferrari to this year’s cricket tie-up. The Big Bang Unico Golf is different. It’s not just commemorating something, it serves a purpose. It has a genuine function, which it performs in a deliciously tactile manner. 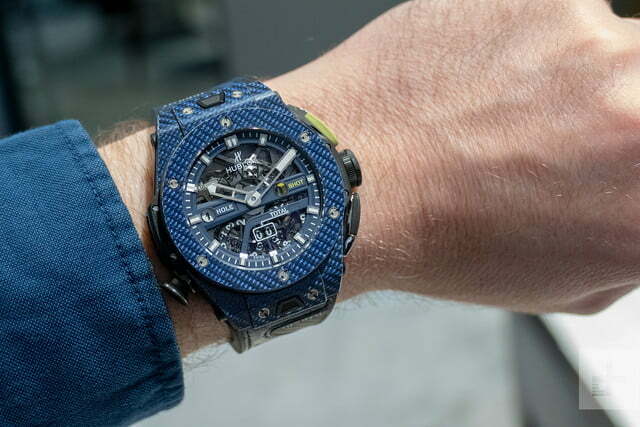 Obviously, this is a Hublot watch and you’ll have to pay for the joy of owning it. It’s $33,500, or 26,900 British pounds, and what’s worse, there are only 200 in existence, so you will have to work to find one. 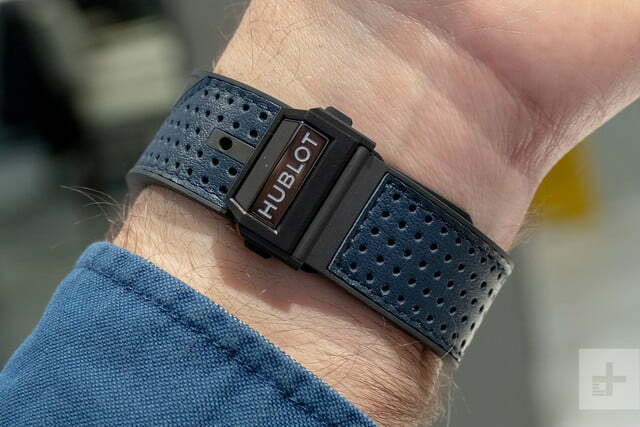 Hublot, despite having given us the Big Bang Referee last year, said it won’t make a smartwatch again, but if it continues to experiment with innovative and fun mechanical watches like the Big Bang Unico Golf, we don’t mind. 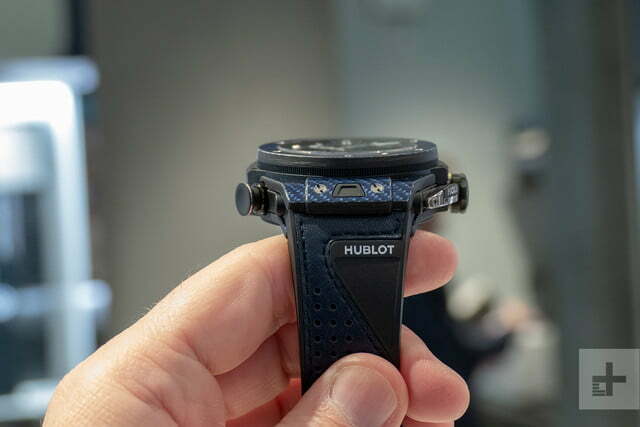 Golf fans who don’t have the budget for Hublot’s golf watch may want to look at Tag Heuer’s special Connected Modular 45 Golf Edition (like Hublot, Tag Heuer is also a LVMH brand). The $1,850 smartwatch comes with a newly-developed, highly-accurate golf app, making it a very different proposition to the Big Bang Unico. Amazon is dropping the price on the Samsung Gear S3 by 37 percent. We've reviewed the Gear S3 and found that it is a great smartwatch for both Android and iOS users. And this deal is one of the best deals we've found online.